The Northern Ireland Air Ambulance Service attending a call out on 23 January at Kilraughts Road in Ballymoney. Photo: Kevin McCauley. The decision came after the motion was put forward for consideration in recent days by former chairwoman, DUP councillor Kim Ashton. The council unanimously backed her assertion that the council “acknowledges the great work of the NI Air Ambulance” and praised it for deploying 33 times to the Mid Ulster area during the first 10 months in 2018. However it is understood that Councillor Ashton amended her own motion to allow her appeal for the annual £182,000 contribution to be deferred to the council finance committee for consideration. Speaking ahead of the meeting, she had said that she anticipated her proposal being deferred to the council finance committee. Her proposed donation would amount to 1/11th of the Air Ambulance total annual running costs. 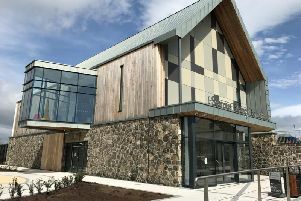 She had also proposed that the council write to the other 10 district councils urging them to match Mid Ulster District Council’s contribution. After the meeting, UUP councillor Trevor Wilson affirmed the “invaluable” service of the air ambulance. “Whilst the people and businesses of Northern Ireland have been incredibly generous with their donations, I don’t think it’s appropriate that such an important and lifesaving service is entirely dependent on self-funding 100% of its operational costs,” he said. Mid Ulster is served by ambulance crews based in depots at Cookstown, Dungannon and Magherafelt. In the past concerns have been raised by politicians about the district having the lowest performance in relation to ambulance response times. It has the longest emergency ambulance response times in NI, 9:41 minutes due to its rural nature. A spokeswoman for the Department of Health said: “The Helicopter Emergency Medical Service service commenced in July 2017 with the Department of Health providing recurrent funding of approximately £1m per annum to fund the medical aspects of the service, and charity funds (including public donations) sustaining the aviation side.